It is well understood that the world's fossil fuel supplies have a finite lifetime --particularly oil. Forward-thinking scientists, political leaders, and other individuals have given thought for years to the transition in energy production that will inevitably be forced upon us as fossil fuel supplies dwindle. Not to be neglected are environmental issues associated with current energy production methods and the new technologies that are evolving. Alternative energy production technologies that regularly receive attention in trade magazines, newspapers, and other publications include direct electrical production from solar energy, electrical generation from wind energy, and hydrogen fuel-cell power for a new generation of vehicles. Certainly, these ideas have strong merit, and indeed, researchers continue to make improvements in solar cell efficiency, wind turbine aerodynamics, battery storage capabilities, and other technologies. However, another technology that appears particularly exciting is that of biorenewable production of fuels and polymeric materials, where the feedstock is simple vegetation, e.g., crop residue, foliage, grass, etc., which regenerates annually, directly utilizes solar energy, and consumes carbon dioxide (CO2) from the atmosphere. This article examines recent advancements in biorenewable research, and it focuses on work being done at Iowa State University (ISU), which is pioneering much development in this area. ISU is the first higher-educational institution in the United States to offer a graduate program in biorenewable engineering. Our society has been very dependent upon fossil fuels for some time. Coal, which is the byproduct of vegetation that was compressed and heated over eons, fueled the industrial revolution and it continues to be the primary fuel source for electricity production. Oil, where ancient marine animals were the starting material, lends itself well to refining, from which many valuable products too numerous to mention are produced. But, perhaps within the next century, most of the world's extractable oil reserves may be gone. What can be done? Obviously, the importance of coal and oil comes from the organic base from which they are derived. Yet the crops that we harvest, the grass that we mow, and the tree leaves that provide us with shade all consist of natural organic polymers, principally cellulose, hemicellulose, and lignin. Cellulose is a polymeric linkage of glucose units, which is an important point, as will be noted in the next section. Glucose is a hexose containing six carbon atoms per ring. Hemicellulose, which is perhaps misnamed as it does not resemble cellulose, contains mostly five-carbon monomers, while lignin, a strengthening agent in plant material is a complex structure that includes benzene (C6H6) rings. Common sense suggests that crop and plant materials offer enormous potential for fuel and polymer production. Governmental agencies, notably the U.S. Department of Agriculture (USDA) and the U.S. Department of Energy (DOE), are funding many research programs on the use of biomass to make fuel, power, and chemicals. One area of particular interest is continued development of byproducts from refining corn-based materials. Of course, one of the hot topics for a number of years has been ethanol production from corn. Debate continues to rage regarding the overall thermodynamic efficiency of grain ethanol production followed by combustion in automobile engines,1 but proponents of the technology make a strong case for the application. However, other beneficial materials may be refined from corn stover and even the entire plant. An excellent article on this subject appeared in a 2005 issue of Chemical Engineering Progress magazine,2. As the flowchart indicates, the process involves breakdown of the cellulose glucose units into practical materials. Besides ethanol, other products include 1,3-propanediol, lignin, and DDGS (Distillers Dried Grain with Solubles). It is also possible to capture the CO2 produced in the fermentation process for commercial sale. As potentially beneficial as this technology may be, it only covers part of the issue. Research on other bio-conversion technologies is underway, and nowhere more so than at Iowa State University (ISU), which is in the middle of arguably the most productive agricultural land in the world. One area of research that is particularly intriguing is known as "Syngas Fermentation." The goal of which is to develop thermal gasification and anaerobic fermentation technologies into a manufacturing system for converting low-value, fibrous byproduct streams into a class of biopolymers known as polyhydroxyalkanoates (PHAs) and hydrogen fuel. The key technologies are gasification, multi-phase mass transfer, and fermentation of the resulting syngas to esters. Several features of this program stand out. One is the production of natural PHA polymers that could potentially serve as substitutes for current polymeric material. PHAs are polymers of the ester family. An Internet literature search of PHAs reveals many interesting details. Depending on the organic chain that serves as "R" in PHAs, the material may exhibit plastic- or rubber-like properties. A very important fact regarding some PHAs, such as poly-beta-hydroxybutyrate (PHB), is that the material "is 100 percent biodegradable. Various bacteria and fungi degrade PHB to carbon dioxide and water through secreting enzymes. "3 Given all the plastic that is used in the food and consumer products packaging industries, one wonders if PHA polymers might become a substantial source of packaging materials in the future. Ester-production technology is particularly intriguing. Many industrial facilities from the small to very large plants have extensive cooling-water systems where scale formation is prevented or minimized by treating the water with polyacrylate (COOH functional group) chemicals. Perhaps the above-mentioned biorefining process could begin to serve as the method for producing polyacrylate starting materials. Another key phrase from the program description is "low-value fibrous byproduct streams." A cheap feedstock is the dream of any manufacturer. Ethanol plants are sprouting like mushrooms within the Midwestern corn belt, so if these new technologies achieve the desired potential, other bioconversion facilities will probably show up in bountiful feedstock areas of the country. One program has the title "Metabolic Engineering of New Fermentation Products." The goal of this research effort is to improve existing, and develop new metabolic processes and biocatalysts to produce organic chemicals. Again, this is a potential pathway to synthesize industrial chemicals that now must be manufactured from oil. Another program of particular interest is the "Anaerobic Biotechnology" offering. A description of the work underway includes, "?it is becoming increasingly vital to explore potential recovery of byproducts from wastes for the sustainability of our environment. Program participants have been developing different anaerobic biotechnologies for the conversion of municipal, industrial, and agricultural liquid and solid wastes into renewable energy." But the above-mentioned research actually uses waste to produce energy. A different program is "assessing the environmental, economic, and social impacts of using biomass-derived feedstock for the production of energy, fuels, and products." The gradual shift in chemical and energy feedstocks from petroleum-based hydrocarbons to biomass has already begun, as evidenced by the large and increasing production of ethanol fuel from corn and the advent of large-scale commercial production of polymers such as polylactide (PLA). The United States has already made large investments to prepare for this transition, but these investments are small compared to the amount that will be invested in building the new infrastructure for a bio-based economy. Such investments are generally irreversible, and once made, set the path of technology for many years. It is vital that we make such investments wisely and do not become locked into undesirable configurations. ISU researchers are analyzing metrics such as how much fossil fuel use can be saved and how water quality will change for different future bio-based production scenarios so that we can anticipate and avoid the downsides of the coming bio-economy. These analyses are particularly important given some of the negative publicity that once belabored ethanol production and another topic, biodiesel fuel production. Difficulties always surround new technologies as the bugs are worked out, but research continues to indicate the thermodynamically attractive nature of turning lignocellulosic biomass into useful products. The technology is becoming more efficient, where, in addition to fuel (including fuel needed to collect the biomass) and chemical manufacturing, electric power generation for supply to the grid will be possible. As the technology matures, other productive and environmentally attractive crops such as miscanthus, kenaf, and switchgrass will serve as feedstocks. Cropping programs are likely to emerge, where multiple crops may be grown during each season, with each being harvested at maturity for the feedstock. Such high-productivity cropping patterns can make more efficient use of land, producing both food and biomass feedstock while keeping crop cover on the soil for longer periods, thereby reducing soil erosion. It is quite clear that a serious effort is underway to research and develop the use of crop residue and other forms of vegetation as starting materials for future fuel, chemical, and polymeric production. The idea has great merit as these feedstock materials grow on an annual cycle, use natural conversion of solar energy, and consume CO2 from the atmosphere. It seems only prudent to employ nature for our benefit. Certainly, biorenewable fuel and chemical production will not totally solve all future energy issues, as we will no doubt have to rely on a mix of techniques, including direct solar-to-electricity conversion7 and others, for energy production. But the biorenewable developments so far offer substantial promise. Certainly another issue to consider is that of national security and reducing our reliance on imported oil and other raw materials. For students interested in chemistry, biology, and engineering, study of biorenewable technology offers a potential career in an exciting, cutting-edge field where the results could greatly benefit humankind. G. Hess, "Ethanol Wins Big in Energy Policy"; Chemical & Engineering News, pp. 28-30, September 12, 2005. G. Bohlmann, "Biorefinery Process Economics"; Chemical Engineering Progress, pp. 37-43, October 2005. University of Saskatchewan website, www.usask.ca. M. Freemantle, "Green Polymer Field Blossoming"; Chemical & Engineering News, pp. 36-39, October 3, 2005. M. McCoy, "The ADM Way of Making Chemicals"; Chemical & Engineering News, pp. 32-33, January 9, 2006. 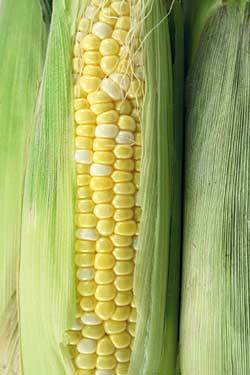 R. Pepling, "Corn socks are coming"; Chemical & Engineering News, pg. 64, January 9, 2006. R. Baum, "Energy is Chemistry's Challenge"; Chemical & Engineering News, pg. 5, October 17, 2005. B. Hess, "Bush Promotes Alternative Fuel"; Chemical & Engineering News, pgs. 50-56, March 6, 2006. G. Ondrey, "The Path to Biorefineries"; Chemical Engineering, pgs. 27-30, April 2006.